Here, Rodney Lee, Senior Product Manager, Aerospace & Defence Business Unit, IFS, explains the intricacies involved in extending an asset’s lifecycle and how organisations can keep life extension projects on schedule, within budget and meeting strict safety requirements. There is an increasing trend in military organisations to extend the lifecycle of aircraft and other equipment. Witness the US military extending the lifecycle of the F-16, B1-B and B-52 for decades at a time and as I write this article negotiations are ongoing for Canada to purchase 25 used F-18 fighter jets from Australia—delivery is expected in 2019. There are multiple drivers in today’s military environment that are influencing which assets are targeted for lifecycle extension. One of the primary factors is the cost of new equipment. For a lot of modern fighting forces, the procurement focus has been on next-generation equipment such as the F-35 fighter jet. This leaves little budget for procurement of other equipment and means looking for cost-effective ways to stretch more service from existing assets. Changing political climates between countries play a key role alongside uncertainty about future equipment requirements. Any procurement project is a complex decision and requires a whole network of stakeholders to agree on a strategy. This complexity leads to decisions taking longer than the people who operate the aircraft would like. The result is usually to buy time and maintain military capability by increasing the lifecycle of existing in-service equipment. This has been evident in Canada, where the Canadian Government has extended the life of its F-18s to 2025—making the equipment over 40 years old and, as I mentioned earlier, is on track to add 25 more. These factors combined explain why the US DoD is extending the lifecycle of the B-52 bomber—first introduced in 1954—well into the 2040s. Likewise, in 2016, Russia announced an upgrade to its fleet of Tupolev Tu-22M3 Backfire intermediate-range bombers with new engines and avionics—with these being delivered in April 2018. There are some key pain points when retrofitting, upgrading or customising an existing military aircraft—regardless of the role it serves and the people who operate them. The first obvious challenge when extending an asset’s lifecycle is maintaining safety and structural integrity for the additional time period it is required to operate. This is critical when talking about airframe modifications, which can be split into two categories of challenges. Firstly, upgrades. When looking at aircraft extensions, the starting point tends to be airframe and avionics upgrades. 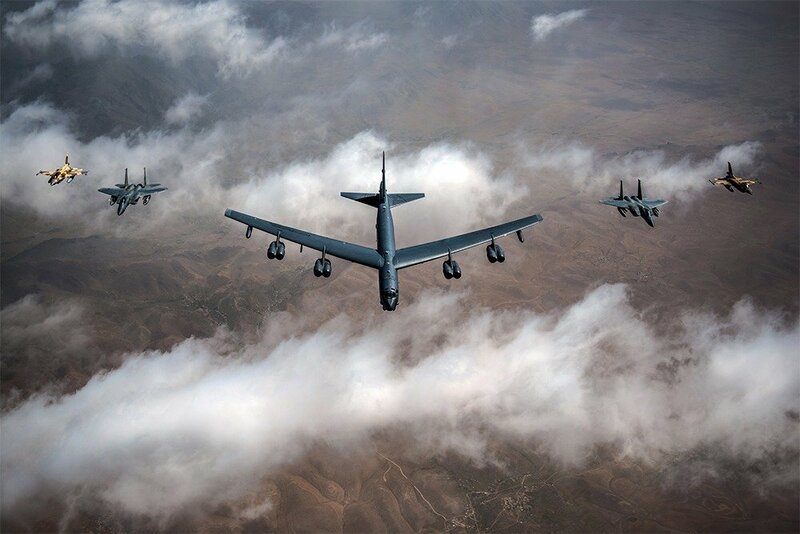 The B-52 is a classic example of this with its multiple new skins and airframe alterations, designed to increase payload capacity introduced over its lifecycle. Secondly, fatigue life must be taken into account. Flying an aircraft for as many years as possible means many flying hours have been accrued, with the intention of adding more. Significant fatigue life analysis must be done in order to understand that the aircraft can withstand the extra flying hours. When aircraft are changed structurally, this brings new considerations for maintenance checking, including fatigue monitoring. These heavy upgrade programmes are extremely complex, so must be managed effectively. Airframe extensions mean introducing new measurements and new components. There are often struggles to manage this additional information, but better data analysis and planning tools can improve the safety and efficiency of airframe upgrades. So good data collection and analytics are vital requirements of supporting software. Modern capabilities of instrumentation, simulation and computer monitoring have often been developed years after these aircraft have entered service—and these tools are getting better every year. Supporting software is now much more sophisticated than the software operating on these legacy platforms. These supporting capabilities and software can and should be retroactively introduced during a life extension programme to provide operators with the tools to track, analyse and manage the extra complexity of airframe modifications and fatigue life. As a large number of aircraft must pass through the maintenance depot during an extension programme, spare parts availability and integrity becomes critical to keep maintenance safe and on schedule. Maintenance crews need the right part in the right place at the right time, or face delays on upgrade projects. Some of the key components which need repair for stress fractures go right down to individual rivets and winglets. If we then look at the significant upgrades required on a long-serving asset such as the B-52, we can see this becomes even more complex—new skins and armaments require retrofitting which can lead to significant structural issues. Make it or fake it? The older an aircraft gets the more complex this becomes, as suppliers cease trading and the supply chain becomes less reliable. With spare parts no longer available from the same sources, this often leads to creative sourcing needs and new internal repair capabilities. Sifting through websites for nearly obsolete spare parts is not an efficient use of military time and resources. The US Office of Naval Research is currently implementing the Quality Metal Additive Manufacturing (Quality MADE) programme to enable cost-effective, on-demand production of 3D printed metal parts for use in maintenance, repair and overhaul (MRO). When this type of technology hits the supply chain, it brings new potential quality and safety questions. With 3D printing and the increased proliferation of counterfeit parts, how do you track and validate every component’s history? Building control and visibility into a supply chain becomes mission-critical—understanding where potential spare parts ‘choke points’ are going to be is important. Decision-makers need to know what the lead time on parts is and that the part they are fitting is safe. Maintainers also need access to reliability history, to inform unscheduled maintenance demands. They must know what the implications of any delay will be. A lifecycle extension programme needs to rely on an integrated approach with a system that can span the complexity of a supply chain to tie all these parts demands into one place. Ensuring an integrated approach across the supply chain is key. This is not an unprecedented challenge, militaries and defence contractors all over the world are used to dealing with large supply chains and there are processes and software tools which have already been developed to manage such complexity. The key is to make sure an extension programme is in line with these new processes and you aren’t relying on legacy approaches to manage new challenges. The military is one of the most effective organisations at recruitment and training of new personnel. It has to be. Even so, as equipment ages, so do the maintenance engineers who keep them operational. Declining transfer of knowledge means a large proportion of key maintenance processes are being lost—opening up a problematic skills gap. At the end of FY 2017, the US Air Force alone reported its total fleet size was 5,400 manned and unmanned aircraft of various ages, conditions and responsibilities. Yet in the same year, the top job on the Air Force ‘Stress List’ was in the “Mechanical Aptitude Area.” Private companies which provide aircraft readiness through in-service support contracts are encountering the same pain point. Current military software systems and processes do not support the retention of tribal knowledge. However, significant developments in commercial software tools over recent years have brought new capabilities not available only a few years ago. In the short-term, point solutions such as augmented reality are coming to the fore to bridge the gap. IFS is already working to deliver IFS Applications on Microsoft HoloLens head-sets to support real-time one to many knowledge transfers from experienced technicians to newer recruits. In the long-term, supporting software must be designed to institutionalise tribal knowledge. Incorporating maintenance history into maintenance systems ensures that the lessons learned stay learned and component history can be tracked from cradle to grave. The ripple effect of this becomes a rolling repository of maintenance knowledge and expertise. Any new engineers, or those who move from one project to another, will have this knowledge at their fingertips. As the volume of maintenance increases, how do military organisations balance the number of required sorties with the need for aircraft to also enter the maintenance hangar? To upgrade a whole fleet may take years, with aircraft in and out of repair on three-month rotations. One flight training school IFS has spoken to is looking to move 17 trainer aircraft through an extension programme in 12 months. This needs detailed planning, as availability must be maintained during these periods—there must always be aircraft operational for exercises and missions. Military organisations and maintenance contractors must balance availability with major overhaul demand and more trips to the maintenance depot. You can’t avoid these visits, so they need to be optimised. The higher the maintenance demand, the more critical it is to make sure work is planned, scheduled and executed optimally. In one organisation IFS now works with, knowledge of when an aircraft would be returned to operational status was previously fed back to a Commander in the form of percentage of completion and a rough date estimate. This was based on talking to mechanics and tribal knowledge of individual aircraft. The same organisation has now gone through a process to standardise documentation and digitise all maintenance work orders to track part status and task completion. The same Commander can now predict to the hour when an aircraft will be available and has seen double-digit percentage reductions of aircraft time in hangar. This is the level of visibility required to track the performance of large-scale upgrade projects, which can take years to complete, and will bring time and cost savings. But more crucially, with most of these assets still playing a key strategic role in military operations, Commanders can rely on an accurate status of equipment when mission planning. Given market, political and cost fluctuations, fleet life extension isn’t something that will go away. It is now a key consideration for military procurement and asset management. Extending any equipment beyond its intended service life is a process that needs to be properly managed and delivered. As we can see, it is a complex process and there are many potential roadblocks—all of which can be navigated with the right approach to managing these projects. Those who act quickly and take control of these projects with the right organisational processes and software support will reap the rewards of increased efficiency, safety and force readiness. Sr Product Manager, Defence Aviation Product Line, Aerospace & Defence Business Unit, IFS. Rodney is responsible for delivering solutions that solve problems for the global defence aviation market.